The market environment has somewhat changed over the past few days. Former leaders are not acting as well as they used to and the jury is still out if we are headed towards a meaningful correction or if we are in the process of further constructive rotation. Further sector rotation would allow for the market to grind even higher and while doing so provide a new set of leading stocks. If you want to thrive as a trader you absolutely have to monitor changes in the market. Then you adapt and adjust your trading approach accordingly. 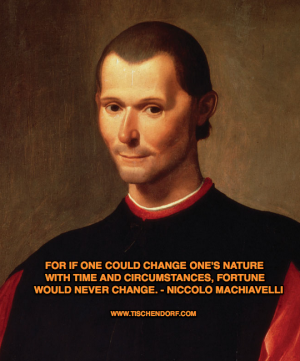 As I just finished reading Niccolò Machiavelli ‘The Prince’ a few days ago I was struck by the following passage. The quote is obviously related to trading insofar as this is great insight and also a universal rule for success. You keep doing what you always did when things change – you get crushed. You adapt your approach when the environment you operate in changes – you succeed and prosper. Enjoy the quote. This must suffice as regards opposition to fortune in general. But limiting myself more to particular cases, I would point out how one sees a certain prince today fortunate and tomorrow ruined, without seeing that he has changed in character or otherwise. I believe this arises in the first place from the causes that we have already discussed at length; that is to say, because the prince who bases himself entirely on fortune is ruined when fortune varies. I also believe that he is happy whose mode of proceeding accords with the needs of the times, and similarly he is unfortunate whose mode of proceeding is opposed to the times. For one sees that men in those things which lead them to the aim that each one has in view, namely, glory and riches, proceed in various ways; one with circumspection, another with impetuosity, one by violence, another by cunning, one with patience, another with the reverse; and each by these diverse ways may arrive at his aim. One sees also two cautious men, one of whom succeeds in his designs, and the other not, and in the same way two men succeed equally by different methods, one being cautious, the other impetuous, which arises only from the nature of the times, which does or does not conform to their method of proceeding. From this results, as I have said, that two men, acting differently, attain the same effect, and of two others acting in the same way, one arrives at his good and not the other. From this depend also the changes in fortune, for if it happens that time and circumstances are favourable to one who acts with caution and prudence he will be successful, but if time and circumstances change he will be ruined, because he does not change his mode of proceeding. No man is found able to adapt himself to this, either because he cannot deviate from that to which his nature disposes him, or else because having always prospered by walking in one path, he cannot persuade himself that it is well to leave it; and therefore the cautious man, when it is time to act suddenly, does not know how to do so and is consequently ruined; for if one could change one’s nature with time and circumstances, fortune would never change. The one post related to this subject that comes to mind is the one where I write about trading approaches with fatal flaws. One such fatal trading flaw is the inability to react to change.